Thursdays are usually pretty boring, right? Well, not any more! I am going to be giving you a short excerpt of AFTER THE END every single Thursday, until I have revealed the entirety of Chapters 19 and 20. But I wouldn’t want to do that. Because then you’d think that the book is about hunting and violence and that Juneau isn’t a very nice person. Instead, we’ll skip over to Part 2 and I’ll give you the chapters where Juneau Newhaven (17) and Miles Blackwell (18) meet. It’s a good introduction to them and the rest of the two-book series. Why am I doing this? Well, I admit, my goal isn’t solely to liven up your Thursdays. I am hoping that you will like the story enough to pre-order the book. So I have put handy pre-order links at the bottom of the page. But DON’T PRE-ORDER IT unless you are thoroughly intrigued by the characters, by their mysteries, by the suggestion that things are not as they seem. So don’t order it right away. Wait until you can’t stand it any more and are totally hooked. And then click the button! Instead of posting each excerpt in a separate blog post, I will just add the new excerpt to this one each Thursday. That way you can easily find your way back to read more. So…are you ready? 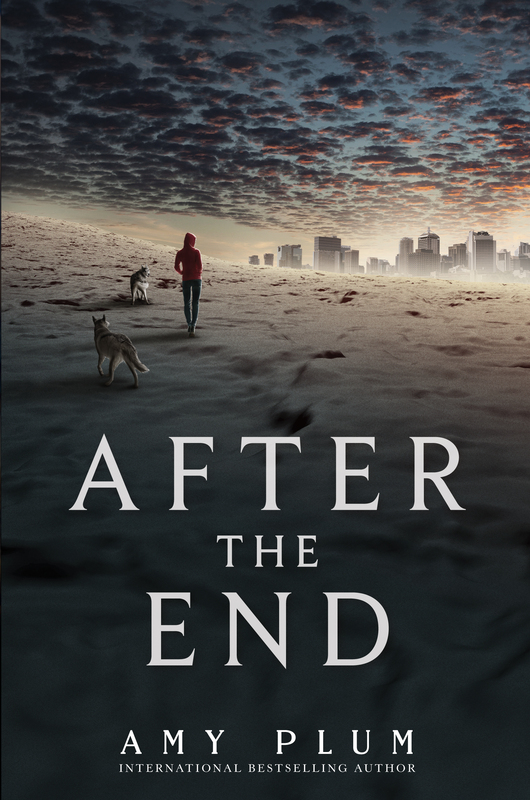 Here begins the world-exclusive teaser of Chapters 19 and 20 from AFTER THE END, to be released by HarperTeen on May 6, 2014. I have searched the streets of Seattle for several days, looking for the person my oracle spoke of, without the foggiest notion of what he looks like. Yesterday I felt he was near, but I had to run from my pursuers before I could spot him. Used to being the hunter, I am now the hunted. Men are chasing me—they aren’t dressed like Whit’s captors, so I have no idea who they are. I just know I have to continue looking for the person I’m supposed to meet while keeping the men at bay. It would help if I knew what he looked like instead of just trusting my hunter’s instinct that he is following me. But the second he walks into the library, I know it is him. I am sitting at my usual table: the one I use whenever the rain drives me off the streets, reading magazines and newspapers to familiarize myself with the events of the last thirty years. I keep my head down, scanning the pages of a Time magazine while I see him glance my way and take a seat at the end of my table. Only when he pretends to be reading a book do I allow myself a peek. I study his features carefully. His light-brown hair is the color of fireweed honey tossed about in a scramble of loose curls. He has a long, straight nose and lips that look like they’re hiding a joke. Or a secret. He glances my way and sees me staring at him. I can’t tell if his eyes are blue or green. I rise, walk to his end of the table, and sit down directly across from him. He watches me, his face reddening with surprise. “What’s your name?” I whisper. The page-padded hush of the room swallows my voice, but he hears me. It’s the answer I’ve been waiting for. I nod and study him for another few seconds. And then I rise to my feet. “Come on,” I say. I swing my backpack over my shoulder and stand next to him, waiting. I extend my hand. He looks at it warily—like it’s an inanimate object. Like it’s one of those mystery boxes Kenai loves to make: you never know if it holds a piece of blueberry cake or a coil-spring snake that will smack you in the face. The boy doesn’t take my hand. Instead, he follows me out of the library into the parking lot. It’s still raining. I pull up my hood and let the rain drizzle down my jacket, while Miles huddles beneath the building’s overhang. “Which one is yours?” I ask. “The Beamer.” Miles points to a silvery-blue car that looks brand-new, and then wraps his arms back around himself. It isn’t very cold, but his shirt is too light for the weather. Doesn’t come prepared, I think, continuing the mental assessment I had begun the moment I saw him. I walk to his car and stand next to the passenger side. “What are you doing?” Miles calls. He gives me an incredulous look. When I don’t move, he leaves his dry spot and jogs through the rain toward me, pressing something on his keys as he runs. I hear the locks click and I open the door, slide in, and stash my backpack in the rear seat. Miles bundles into the car and turns to gape at me. “What are you doing?” he repeats. His jaw snaps shut and his eyes grow wide. Green eyes. I can tell now. They’re the dark blue-green-black of a Denali lake at dusk. The thing about lake water is it’s opaque. You never know what’s hidden underneath. “What I know about you? Nothing!” he says. I stay silent, crossing my arms as I wait. He sees that I won’t talk until he does. “Seriously,” he claims. “All I know is that some people are looking for you. And the locals think you’re crazy because you go around asking people’s names.” He pauses, looking sorry that he said that last part. Understandable. It’s not the kind of thing you would want to mention when sitting in an enclosed space with said crazy person. “Do I what?” he asks, looking cornered. “Um, I would have to say…at this moment…yes,” he admits. I chew my lip and look out the window at the parking lot. No question about it—I’m sure Miles is the one Frankie foresaw. I look back at him and raise my eyebrows impatiently. “What?” he asks, looking defensive. His features flip through a series of comical expressions: incomprehension, doubt, surprise, and finally exasperation. I lean forward to peer at the point where the sun hides under the rain clouds to get my bearing. “It looked kind of desertlike. Kind of Wild West. It’s in that direction,” I say, pointing southeast. “What’s in the suitcase behind the seat?” I ask. “Um…clothes,” Miles says, fidgeting. “Yeah, I forgot about that. But I could take you to your hotel if you need to get…supplies.” He rearranges his face into a helpful smile and then lifts his eyebrows in a way that I think is meant to charm me. Nome would be eating this up, I think. She had actually gone through the Encyclopedia Britannica and ranked the photos of every scientist, politician—anything male—from one to ten, based on “charisma,” as she called it. I can never think of John F. Kennedy without the number 7.5 popping into my head. But I feel only amusement watching Miles. I have goal, and he is the one who will help me. My interest ends there. “Well, then, why don’t you rent a car and drive yourself?” he asks curiously. Miles clenches his jaw in frustration. He digs his fingers into his temples and squeezes his eyes shut. And then, opening them again, he glares at me. Doesn’t like to take orders, I think, noting that tidbit on my checklist, and then add, Is used to getting what he wants. “Who the hell is Frankie?” A note of hysteria creeps into Miles’s voice. “You take advice from an insane alcoholic?” Miles’s face is dead serious now. “How does this Crazy Frankie even know who I am?” Miles asks. Miles stares at me, all semblance of coolness gone. He looks scared. “You are psychotic,” he says, eyes wide. Tearing his gaze from mine, he sits for an entire minute staring straight ahead at the parking lot. He needs you as much as you need him, Frankie had said. I wait. I get to the contraption first. “Is this your cellular phone?” I ask. Clasping it in my hand, I close my eyes and contact the Yara. I’ve been waiting a week for this to happen. I’m ready. A little spark flies out of the side of the phone, and its screen goes dead. My brain hurts. I am so far out of my comfort zone that I might as well be in the Amazon, swimming with piranhas. This girl somehow just broke my phone and now she’s telling me to drive her to Mount Rainier. And I’m actually arguing with her over directions, like we’re some geriatric married couple. “And you know that because Crazy Frankie told you,” I state incredulously. “I don’t think he’s actually crazy,” she says. “Because. As I said, we have to go to that mountain first,” she insists, nodding in the direction of Mount Rainier. I just sit and stare at her for a minute until I remember how valuable this girl is to Dad and the fact that my name is, at this very moment, written in his bad books in bold capital letters. The last thing I want is for her to get out of my car and find someone else named Taxi or Greyhound Bus and ditch me. “You are taking me,” she says, as if I have no choice in the matter. Man, does she have me pegged: I need her as much as she needs me. “Seat belt,” I say. She looks confused. “If I’m taking you, you have to wear your seat belt.” Still no reaction. I yank on mine, demonstrating what a seat belt it, and she fiddles with hers until she finally gets it attached. I mash my foot on the accelerator and go. We drive in silence for a few minutes, which is good, because I have to get my bearings. I search for road signs, finally see one for MOUNT RAINIER NATIONAL PARK, and follow it east out of town. We drive over long bridges spanning large bodies of water, and past ugly urban sprawl until mountains appear in the distance, one capped with snow. We’ve been on the road a good twenty minutes before I notice that the girl is holding onto the dashboard with both hands. “You’re going kind of fast,” she says in an accusatory voice. “It feels fast to me,” she mutters. She frowns and lets go, but moves her hands to the edges of the seat on either side of her legs and clutches tight. I decide to ignore her completely until I’m on the highway going out of town, at which point I speed up to sixty and relax. We pass a sign saying 54 MILES TO MOUNT RAINIER, and I see the girl’s eyes flick from the sign to the speedometer and back as she calculates how long it will take us to get there. She looks at the sun, or at least where the faint shape of the sun lows from underneath the rain clouds, and then at the dashboard clock, and finally lays her head back against the headrest and relaxes. And when I say relaxes, I only mean she doesn’t look like she’s going to explode or spontaneously leap out of the speeding car. I wish she’d take out that contact lens. It freaks me out. One of the goth girls at school has scary yellow cat-eye lenses. Definitely not my scene—the artsy goth posers. And thinking of school reminds me that, however weird she is, Cat-eyes will be attending graduation next month, and I won’t. I step on the accelerator, and the engine roars as I take the car to ninety miles per hour. And when I see the girl’s fingers grip tightly around the edge of her seat, I smile. We drive the next hour without speaking. As we approach the mountains, city-appropriate sedans are gradually replaced by massive pickup trucks and semis stacked with logs. One-story identical wooden houses are lined up side by side like a countrified version of Monopoly. After a little while, I turn the radio on—my music is on my dead phone—and all I can find is country. I keep it on—it’s better than sitting in silence with the odd boy-girl. I can’t help but glance from her every once in a while; she could be part Asian, with high cheekbones and thick black hair. Her clothes look straight from the men’s section of Old Navy. Her hairstyle is truly ugly; It looks like she got a bad crew cut, and now that it’s growing out, she’s spiking it to make herself look taller. Or fiercer. She’s small. I’d say five-five was a pretty close estimate. When she’s quiet, she looks her size. But when she talks, she somehow gains a few inches…becomes bigger than herself. When she first got in the car, I thought, If she’s insane and freaks out in my car, I can take her, but now I’m not so sure. There’s this energy…and anger…jam-packed into every inch of her. Dad said that calling her an industrial spy was “near enough to the truth.” When I first saw her, I couldn’t imagine her being involved in anything spy-related. But now she’s sitting inches away from me, I totally can. She seems dangerous. As if reading my thoughts, she glances over at me, and when our eyes meet, she glowers. “Where are you from?” she asks. I hesitate, and then decide it can’t hurt for her to know where I live. “L.A.,” I say. She just stares at me. “Where is…Ellay?” she asks finally. “Los Angeles. It’s in—” I say. I turn off onto a two-lane road, and we pass a group of hunters dressed in brown camouflage, carrying guns. I hate guns. Dad tried to take me hunting once. I spent the whole time in the lodge playing video games, refusing to go out on the hunting range and embarrassing him in front of his friends. “What is your whole name?” she asks, continuing her interrogation. Uh-oh. Now we’re in tricky territory. Everyone’s heard of Blackwell Pharmaceutical. My last name is usually a status symbol, but right now it’s probably better not to flaunt it. “Why would I tell you my last name when you haven’t even told me your first?” I lob back. “My name is Juneau,” she says. “Like the goddess…what, queen of Olympus?” I ask. “No, like the capitol of Alaska,” she responds. Bingo! I think, remembering that Dad had mentioned that the girl was coming by boat from Anchorage. Juneau points to a National Forest road map posted by the side of the road. “Stop here,” she says, and clicking off her seat belt, gets out of the car before I’ve come to a complete stop. She stumbles slightly as I slam on the brakes, and then, catching her balance, walks to the sign as normally as if she bails out of moving cars all the time. The girl’s on drugs. That’s got to be it. Whatever secret drug Dad’s trying to get his hands on, she’s probably already taking it by the truckload. Unless it’s an antipsychotic pill, in which case she could use a few. She studies the map for a few minutes, and then walks back to the car, gets in, and says, “Okay. Drive.” Like I’m her chauffeur or something. “Would you mind telling me where we’re going?” I ask, masking my sarcasm to avoid another nasty scowl. The girl—Juneau—scares me, and it’s just not worth getting her riled up. “Up there,” she says, pointing halfway up the mountainside. “That way.” She points up the mountain. “Oh yeah,” she says, as if it hadn’t occurred to her. She leans over and slams the door shut, and we’re off. If you’re dying for more, click below to pre-order!